I don’t know where you live, but the spring is finally coming to the place where I live. This is my favourite season because everything seems so fresh and exciting. Hope you start to enjoy the wonderful season too :). 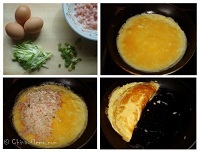 If you are interested in the egg recipe, you may like to see this Chinese Omelette recipe . Inspired by Japanese version egg wrap rice, which is a fun and easy to make, looks nice too :). Hopefully this will add one more interesting egg dish to your table. You may or may not see my post about Hunan Iron Plate Grilled Food , but I have added a video for it, so you can see how the food is cooked plus more pictures. You can also watch it from my Youtube channel . I have updated a post about Hunan preserved pork. This time I added one more recipe for Hunan preserved pork dish (click the link to find out more). You will see how we prepare the Hunan preserved pork at home and cook a dish using preserved pork and vegetables. ChineseFoodDIY's cookbook "Real & Healthy Chinese Cooking" - 500+ low carb and low fat recipes with 170+ colorful pictures. Based on a master chef's 40 years of cooking practice and 4 years of writing and research, it has helped over 12,800 people worldwide improve their health. Ok, that's for March, hope you like it. Please feel free to share with friends, or forward them to Authentic Chinese Food Lovers Ezine subscription . Thank you! Until next time, enjoy life and happy cooking!